Derwent are underlining their position as the go-to brand for premium art materials with the relaunch of its pen category. The Derwent Line Maker range has been adapted to feature new recyclable packaging, clearer descriptions and new visuals following discussions and focus groups with a selection of UK and international creatives. Often used by artists fo intricate detailing or sketching, the Line Maker range will now feature an extended range of colours, presented in eco-friendly packaging. In addition to the 6 new colours, which will sit alongside the popular black, grey and sepia ranges, the black fine liners have been reformulated to a new permanent formulation. Praised for the versatility of its Japanese nib, with its free-flowing line and ability to create fine detail, the Line Maker range features clearer product descriptions on the packaging to allow consumers to choose their materials easier. The pens will continue to be in 0.05mm, 0.1mm, 0.3mm, 0.5mm and 0.8mm thicknesses (black only), offering artists the variation needed to create different shapes and tones. The line maker ink formulation is permanent once dry and highly lightfast, meaning artists are safe in knowledge that their work will be vibrant in colour whilst lasting over a hundred years under museum conditions. 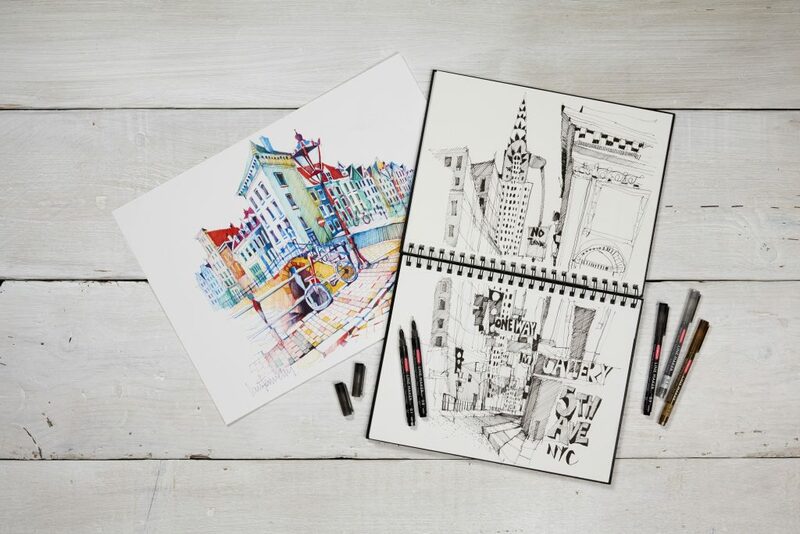 Mike Stranders, General Manager at Derwent said: “The Derwent Line Maker range is widely-respected for its fine, free flowing ink and its ease of use for detailed drawings. The range has been expanded to increase the colour possibilities for artists. “With new recyclable packaging, we’re strengthening our commitment to being environmentally friendly whilst not losing sight of the requirements of artists.